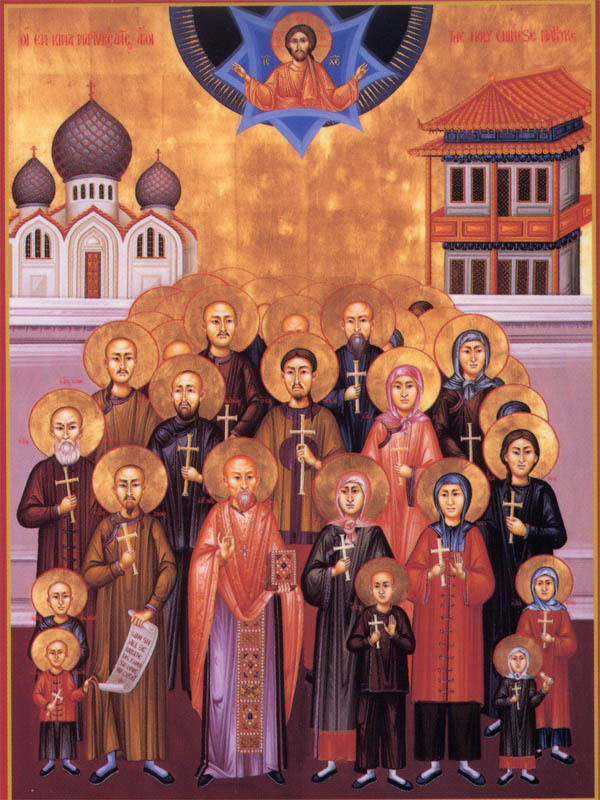 On this day, second Sunday after Pentecost, we celebrate the Synaxis (gathering) of the Chinese Orthodox Christians who were martyred in Peking during the Boxer Rebellion in the year 1900. In the year of our Lord 1900, when the Empress Dowager reigned over the vast country of China and supported the Boxer Rebellion against all foreigners, two-hundred twenty Orthodox Christians in Peking died as martyrs, although a few others lost courage and renounced the truth of the Gospel. Leader of the martyrs was the Priest Metrophanes Tsi-Chung. Many others followed his example and became martyrs with him, by various means, among whom were his wife Tatiana and sons Isaiah and John, Isaiah’s fiancée Maria, also Paul Wang, the teacher Ia Wang, the eight year old boy John, Clement Kui Lin, Matthew Chai Tsuang, his brother Witt, Anna Chui, and many others, whose names are known by the Lord of life who awards the crowns. who continually lift their hands in prayer for her. The good earth of China bore fruit, the God-loving Martyrs. By the intercessions of Your Saints, O Christ our God, have mercy on us and save us. Amen. When you renounced your false ancestral errors all, * you came to know that Christ is God and Lord of all. * When you courageously proclaimed that He is the only Savior, * you endured the suffering and the tortures as if you were * bodiless, and you received from His hand the unfading crown. * And now you intercede for all of China * to see the light of knowledge, O Martyr Saints. In recent times you imitated the martyrs of former times in your victorious contests, O blessed Saints, for you competed valiantly for Christ. Watering the holy Church of the great land of China with your blood, you have received a crown from Lord’s hand. As you are standing near Him in the heights, commemorate us who honor your martyrdom. Sweet is the death of Martyrs and full of gladness; for the abuse and tortures endured for Christ bring an abundance of honor. Therefore the great multitude of Chinese martyrs has brought spiritual joy to the entire Church today, as she marvels at their courage and steadfastness of mind, and also their indomitable confession of faith, by which they glorified Jesus the giver of the crowns, after being killed in various ways. We who love martyrs dutifully celebrate them and in faith cry out to them: “Athletes of the Lord, worthy of God, as you are standing near Him in the heights, commemorate us who honor your martyrdom.